What is the height (in cm) of parallelogram A? What is the height (in cm) of parallelogram B? What is the base (in cm) of parallelogram C? What is the area (in cm2) of parallelogram A? What is the area (in cm2) of parallelogram B? What is the area (in cm2) of parallelogram C? What is the area (in dm2) of the parallelogram above? What is the perimeter (in dm) of the parallelogram above? 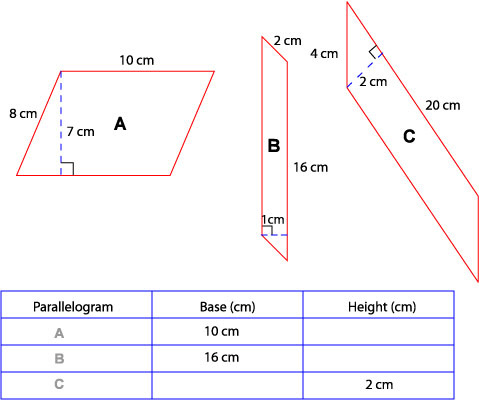 What is the area (in mm2) of parallelogram ABCD? What is the perimeter (in mm) of parallelogram ABCD?